Here is a list of everything I've used to bottle (and carbonate) kombucha, and the results I got. Kombucha — much like sour beer — makes for a natural pairing with fruit, due to its tartness and acidity. And since the sugars in the fruit are gobbled up and turned into carbonation, it's got all of the nutrients without the carbohydrates. Makes for a great morning drink. The list will be updated as I try new things. Table Sugar - I have never achieved any carbonation with table sugar. I have no idea why. Let me know if you have any guesses. Agave Syrup - Same results as table sugar. No noticeable flavor contribution either. Honey - No carbonation over the short term; inconsistent carbonation after a number of weeks, accompanied by a funky, cidery flavor. Not recommended. Black Currant Syrup - Syrup (the kind without weird chemicals or High Fructose Corn Syrup) can be cheap and easy, and it lasts a while, but it wouldn't be my first choice. The results always tasted sweeter and more syrupy than they should have, and the flavor was thin and one-dimensional. I don't believe syrup ferments as fully as juice or whole fruit. Not recommended. their Guava juice is my favorite thus far. Mango Juice (1) - Cheap Goya brand mango juice. The mango flavor works well with kombucha, and the juice ferments out fine, but the result always seemed a bit thin and one-dimensional. Only recommended if you can't find better quality. Apricot Juice - See Mango Juice, above. Goya brand. Not recommended. Mango Juice (2) - Ceres brand mango juice. Much better quality than Goya brand. Flavor is nice but not as good as I would have expected; seems to overwhelm the subtler flavors of the kombucha. Good carbonation. Guava Juice - Ceres brand guava juice. Purchased in a carton from the natural food store in Beacon. This should go without saying, but the quality makes a big difference. Plus, I believe the flavor of guava juice is inherently complimentary to kombucha, adding tartness and a complex tropical flavor. This was easily the most multi-dimensional of all my batches, without losing its "kombucha-ness." Even the aroma was superior to other batches I've made, with a bright, funky fruit character reminiscent of a nice lambic beer. In addition, a small amount of juice — about 1.5 tablespoons — produced brisk, consistent carbonation. Highly recommended. 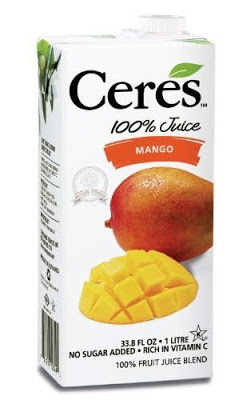 Litchi / Lychee Juice - Ceres brand litchi juice. Works extremely well, with a subtle character that adds only slightly to the base flavor of the kombucha. Mildly fruity, tart, and settles out quickly for a clearer, prettier kombucha than most other fruit juices. Good carbonation. Highly recommended. Passion Fruit Juice - Slightly similar to Guava juice (also Ceres brand), although more subdued in flavor, and less brightly fruity. Funky, and similar to plain kombucha, but otherwise kind of dull and flat. All-in-all, I would recommend just using Guava juice instead, which is similar but has a much better flavor. Strawberries (Frozen) - Frozen fruit offers a number of conveniences, and is easy to jam into your bottles. The flavor of strawberries is a wonderful compliment to kombucha — subtle on the actual fruitiness, but adding a nice acidity and tartness without seeming one-dimensional. Recommended — one of my favorites. Blueberries (Frozen) - My batches bottled with blueberries haven't been as successful as those with strawberries. The non-porous (compared to strawberries) skin of the fruit didn't allow the bacteria to munch away at the sugars, apparently, and none of the bottles developed the full carbonation I expected, given the amount of fruit I used. (A comparable amount of strawberries resulted in almost explosive carbonation). I sometimes find boiling table sugar in water for a longer time than it takes to sterilize (~15 mins) helps speed carbonation when bottling beer. I think it breaks the sucrose down into its constituent glucose and fructose. You could also try adding a weak acid like lemon juice to the sucrose solution to do the same thing. Interesting point about the boiling sugar, I wasn't aware of that. I'll definitely have to give it a try... I don't actually boil the sugar for my kombucha, just nuke the water in the microwave for a minute to heat it up. I think using juice to carbonate is much more forgiving than you'd expect. I find 1 tablespoon of juice per 12 ounces of kombucha gives both good fruit flavor and good carbonation (though obviously some fruit is more potent than others, flavor-wise). It's also another benefit of using those 500 ml PET bottles — if they do end up over-carbonating a little bit, the bottle will start to swell and you'll know. But that's only happened to me like, one time. If you were bottling in glass, of course you'd have to be more careful, and just start out with a smaller more conservative amount of "priming juice." As for the best source, I don't think you would go wrong with fresh juice, fresh fruit, or basically anything quality from a natural food store. I've never had an infected batch from fruit; if anything, the natural yeast in the juice/fruit probably just help out the carbonation. The PH at that point should be low enough to kill off anything nasty pretty easily. Hey, so the fruit has worked! I did three different bottles; one with unpasteurized apple cider (frozen since the fall), one with frozen pureed peaches, and one with frozen pureed strawberries. All three seemed to have worked, I've only tasted the apple cider one so far and it had light carbonation (I could have left it a bit longer) and tasted great! I've been making kombucha for several months now and of the fruits I've tried... cherry/cranberry juice (cheap stuff); raspberries, blackberries and ginger... everything created carbonation except the blackberries. My last batch, I carbed in 3 different 64oz growlers. Also the carbonation seems different... it's not as biting as when I carbonate my beer. I actually enjoy the biting carbonation which I think would balance the tart/sweetness of the kombucha. 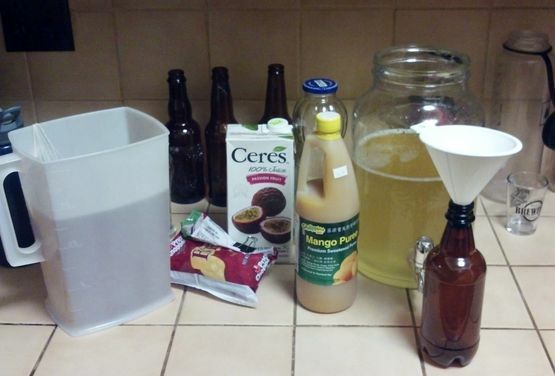 Has anyone ever kegged the kombucha? ^^there's a guy in my city who rides a bike around town, chilled kombucha keg on board, dishing out free kombucha.. takes it to music festivals too..
as for carbonation, I don't add sugars at bottling, but only flavors like orange rind or flowers etc.. I find just capping bottles and waiting a day or so charges them great.. maybe I am bottling earlier than everyone else.. this way I find some sweetness ferments out during bottle refermentation. on another note.. currently preparing a B. clausenii starter for a 100% Brett beer.. and planning on spiking my kombucha scoby with a dash of the Brett starter.. I've come across some journal reviews which claim several species of Brett are commonly found on scobys.. hopefully my kombucha will funk up some..
Hey Stevan! I've heard the same, that Brett is naturally often present in SCOBYs. Early on I also added some Brett to mine. Sadly, I can't say I really noticed any significant difference, but it's certainly worth trying! Anyone ever used dextrose like you would with beer? Maybe I missed it, but how many/much strawberries did you add at bottling to carbonate?